On arrival in Cape Town you will be met by your tour guide and transferred to your hotel near the Victoria & Alfred Waterfront. In the afternoon we collect the motorcycles and explore the Atlantic Coast a little at Sunset. In the evening we enjoy the city lights and a welcome dinner (included). After breakfast we travel along the West coast to Ysterfontein, a popular holiday area for locals, before we begin travelling inland to Tulbagh. Perhaps visit the Old Drosty and enjoy a light lunch (own account) before we ride across the beautiful Bains Kloof Pass to Wellington and our accommodation. Try some of the excellent wines from the region with dinner. After a leisurely breakfast we head out to Franschhoek. Our route today takes us through vineyards, across lovely passes and through green valleys. In the afternoon we reach Montagu and can relax a little before dinner at a restaurant nearby (own account). 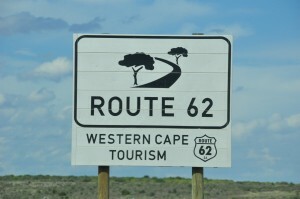 Today we ride “Route 62” deviating from the road in Barrydale to enjoy the scenic Tradouw Pass and returning to it via the Gracia Pass which connects Riversdale with Ladismith. Before we reach Calitzdorp we are treated to another Pass, the Huis River Pass. After a leisurely lunch (own account) we leave the tar and travel to Oudtshoorn. (Alternatively we can continue along the tarred Route 62). We check into our guesthouse on a working ostrich farm and enjoy dinner and warm country hospitality. After a morning visit at the Cango Wildlife Ranch we make our way towards the Groot Swartberg Mountains and the Swartberg Pass. The 27km long Swartberg Pass is considered one of the most spectacular mountain passes in the world: an untarred road winds to the summit 1 583 metres above sea level in steep zig-zags and sudden switchbacks, with breath-taking views at every turn. We enjoy lunch (own account) and a good rest in Prince Albert before returning to Oudtshoorn via Meiringspoort. Soaring cliff walls with spectacular rock formations line the 25 km tarred road which winds along the floor of the gorge, crossing the Groot River 25 times. Each crossing, or drift, has its own name and story. We stop at the Waterfall to learn more about this unique pass and its road. After returning to our guesthouse for a refreshing swim we enjoy dinner at one of the restaurants in town tonight (own account). Today’s route takes us along historic and scenic gravel roads across mountains and through lush forests. 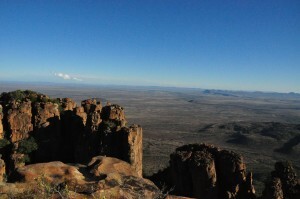 We leave Oudtshoorn early and travel over the Montagu Pass to George. This gravel road is the “old Road” linking the little Karoo to the Garden Route. After a coffee break in George we continue along the Seven Passes Road to Knysna. 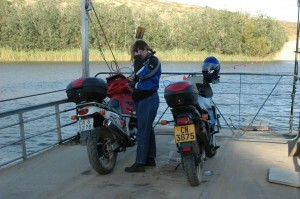 We enjoy a picnic lunch en route and arrive in at our guesthouse on the Knysna lagoon in the late afternoon. (Alternatively we travel across the tarred Outeniqua Pass and along the National Route N2 through Sedgefield to Knysna). After checking in and freshening up we head for the Knysna Waterfront for dinner. 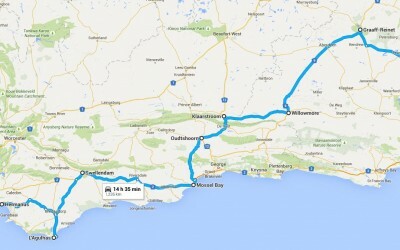 Today’s journey takes us up into the Addo region and to the Amakhala Game Reserve. We leave the bikes safely at Reed Valley Inn and arrive at Woodbury in time for the afternoon Game Drive. where our qualified ranger will bring the African bush a little closer and we can spot some of Africa’s wildlife from an open safari vehicle. After an exciting wildlife adventure we return to the lodge for dinner. The next morning we start our way back. Passing Port Elizabeth we make our way to Jeffreys Bay for a little lunch (own account) and maybe a short swim in the Indian Ocean. We continue on the N2 to the Tsitsikamma Forest and our last stop before we check in at our lodge is at the Storms River Mouth. 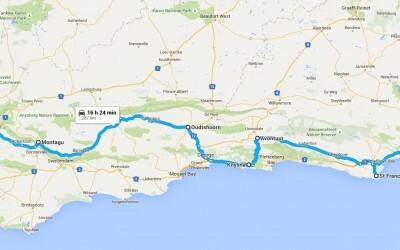 Today we continue our journey along the Garden Route on the national route N2. We deviate from the route to cross the Bloukrans Pass and enjoy the scenic drive through Nature’s Valley. 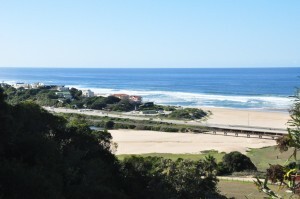 We enjoy lunch with a view out to sea in Plettenberg Bay (own account) before continuing on to Mosselbay. After checking in to our guesthouse we enjoy dinner at the nearby Stone Hill restaurant (own account). After breakfast we ride along the Coast on our way back towards Cape Town. Enjoy the road as it winds its way along the coast to Somerset West. After a short trip on the highway we make our way back along the coast around the Cape peninsula. 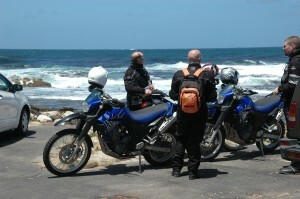 After stopping for lunch (own account) we ride across the famous Chapman’s Peak Drive to Cape Town and the hotel. After breakfast we make our way the rental Station to return the motorcycles. Enjoy some shopping at the Victoria & Alfred Waterfront, explorer the city and go up Table Mountain. (weather depending & own account) At the evening we go to our fare well dinner at one of the many restaurants in Cape Town.